Bariloche (Agenzia Fides) - "No kind of violence is the solution: A dialogue table should have been opened before or during the conflict, to avoid this repression and violence. Dialogue must always be present": these are the words of the Bishop of Lomas de Zamora and President of the Episcopal Commission for Social Pastoral Care, Mgr. Jorge Rubén Lugones, SJ, in support of the Bishop of Bariloche, Mgr. Juan José Chaparro. Mgr. Chaparro has the role of mediator at the dialogue table, formed to seek a peaceful solution regarding the conflict between the Government and the Mapuche people. This conflict, which originated in the territorial property of the native people, has already caused a victim, Rafael Nahuel, who lost his life hit by a bullet on 25 November. 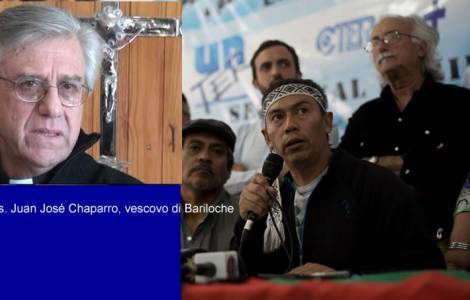 According to information sent to Agenzia Fides, the Bishop of Bariloche recently told journalists that the Mapuche community "is looking for a dialogue", stressed that land conflict is a "debt and a historical urgency" and that "communities are not for violence". He also rejected the claim that the RAM group (Mapuche Ancestral Resistance) acts in the conflict area, as reported by the government. "What I know is a Mapuche community, which is not RAM.It is true that there have been incidents, but I do not even know the faces of RAM", the Bishop reiterated. Mgr. Chaparro stressed the need for everyone to "give something, to surrender" in the framework of the dialogue table, which continues today, and asked "not to throw fuel on fire". Representatives of social organizations, human rights and opposition political sectors have called for a multi-sectoral dialogue to contribute to the search for solutions to the problems of the lands of indigenous peoples and to put an end to the harassment campaign towards those communities.